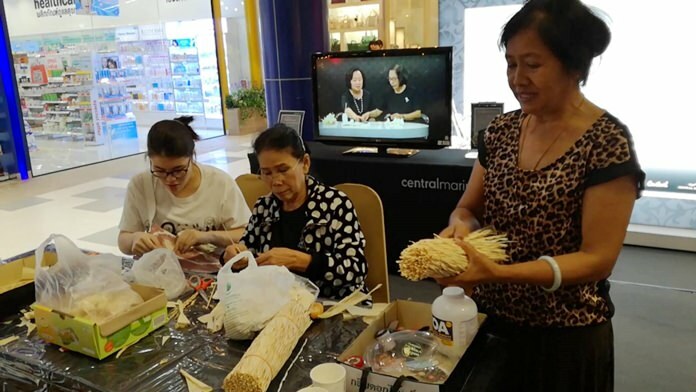 The Central Marina mall is giving everyone a chance to contribute to HM the late King’s cremation ceremony in October by creating artificial flowers. Amphai Buaplengsri, member of the Pattaya Women’s Development Club, opened the flower-making zone at the North Pattaya shopping center June 15. The zone will be open until Aug. 30 with flowers created going to the Oct. 26 cremation ceremony. Volunteers are making daffodils, or “dararath” in Thai, which is considered a sign of love and was favored by both King Rama IX and HM Queen Sirikit. The species are native to meadows and woods in southern Europe and North Africa with a center of diversity in the Western Mediterranean, particularly the Iberian Peninsula. Both wild and cultivated plants have naturalized widely, and were introduced into the Far East prior to the tenth century. HM King Bhumibol favored the flower while he was in Switzerland. Amphai told reporters the club is looking for volunteers who wish to honor HM the late King to create flowers. Those interested can visit the ground-floor between 12 p.m. and 8 p.m. and be given lessons on how to make the flowers.